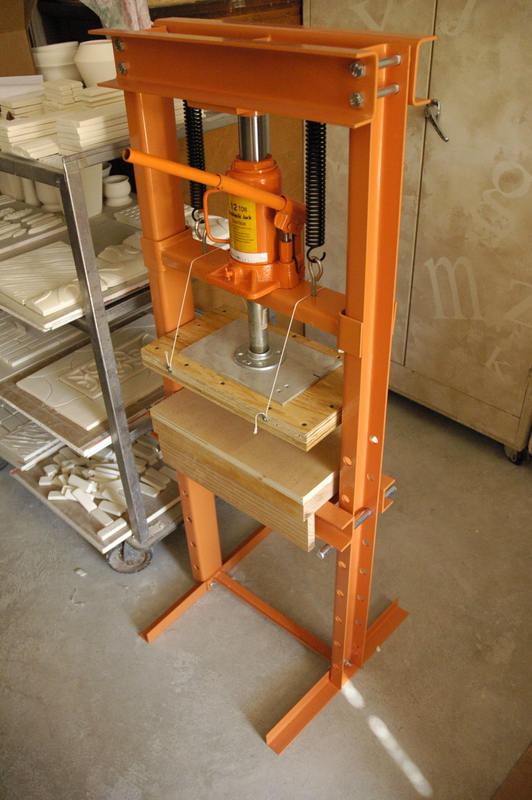 We were planing to build this design of tile press that we found in the book Handmade Tiles by Frank Giorgini. But this one is cooler and has more power. It’s a 12 ton shop press from Harbor Freight Tools. 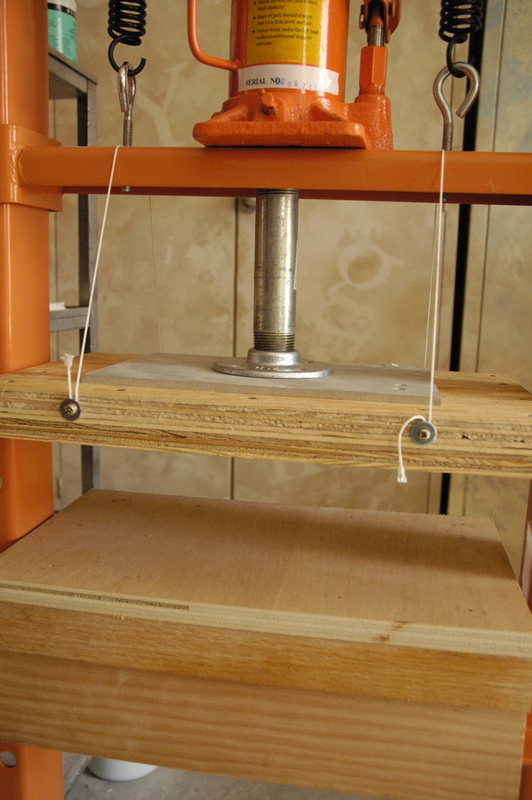 The Giorgini press would cost at least $80 to build and take a good day of work maybe two. This bad boy was $100 on sale and took me a half hour to set up. It has the capability to turn your plaster molds to dust, plus if you ever need to press some bearings or U joints on your vehicle you’re good to go. All I had to do was add the press plates. The top one is two sheet of 3/4″ CDX plywood glued and screwed together. Then I attached a 1″ pipe flange and 6″ piece of pipe to keep it centered. The bottom plate is a 3/4″ piece of scrap cabinet grade plywood on top of a 5/4 piece of oak and has some 1x stringers to prevent it from sliding around. I’ll post some photos of it in action soon. 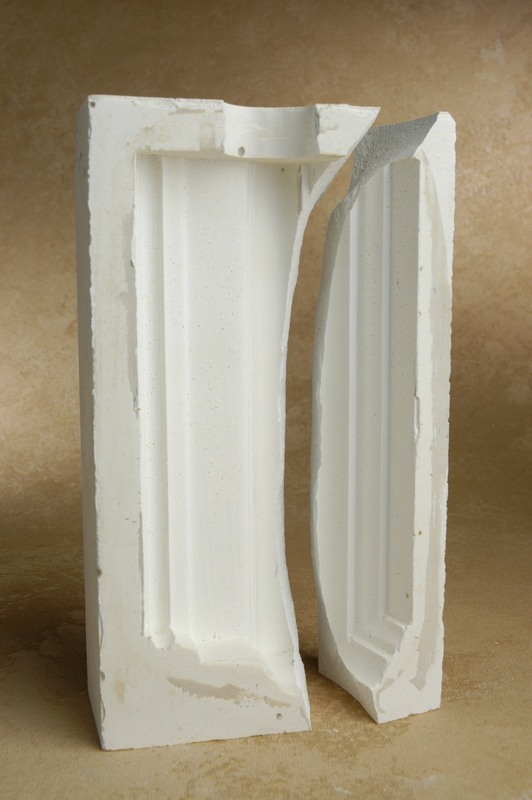 I did a test with one of our existing slip molds for making a piece of tile trim. Worked well up until the point that it blew out the side of the mold. Update photos of mold breakage. That looks like a pretty cool tool. What do you mean it blew out the side of your mold? Did it crunch and distroy it? It works really well, maybe too well. 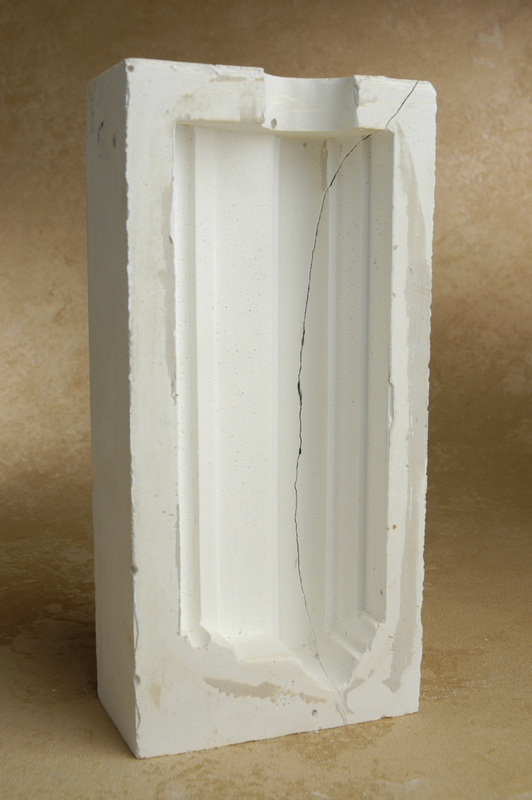 It will take some time to get a feel for the amount of pressure a mold can withstand. We have a series of open faced molds that we gang together so the bottom of one closes the face of the next one and then poured slip clay in to them to make solid moldings. I used one of those molds and put a log of clay in it and started pumping . It broke the mold from the outward pressure of the clay being pushed into the mold. I’ll post some photos. Before I put the wooden plates on I stuck a 2×4 in between the ram and the horizontal rail. It snapped it in half like a twig. Hi, Thanks for the good info on the press. Do you happen to know how much it would move if we didn’t bolt to the floor. Doesn’t look like you did from the pic, but wasn’t sure. Ours is not bolted to the floor and probably never will be. We’ve needed to move it a few times. It doesn’t move at all during use. I’m sure it would in a mechanics shop as it is designed for but pressing clay is very light duty work for this. In fact I would recommend a lighter duty press, this is very powerful. 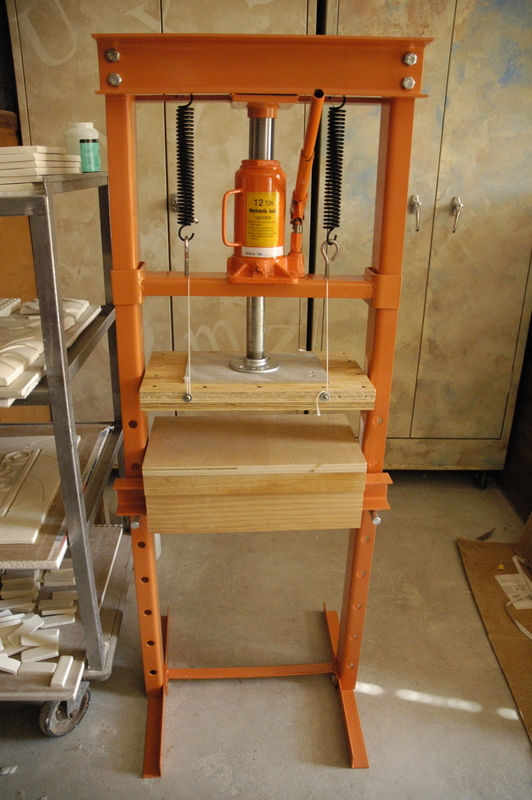 I am interested in building a tile press as well…did you buy this somewhere or build it yourself? Harbor freight. It’s in the post. I see you: bought the whole thing at harbor freight, i thought you meant just the hydraulic mechanism, thanks! Yep I just built the wood press plates, some five year old Chinese kids did all the hard work. Could it be used in lieu of a slab roller for 8″ x 14″ slabs 3/8″ thick ? Sure could. I would make a 8×14 frame out of plywood to compress the slab within. You used wood as your plates? I have a book by Reid Harvey that uses the same press but he says it requires 3/4″ plate steel…. Yes I made a set of wood press plates for working with our plaster molds. The press came with a set of steel plate for it’s intended purpose of pressing bearings and other automotive and industrial jobs. But for our purposes the wood plates work just fine. If you were pressing plates you would be using a metal mold. You are correct the ram does move in minute increments but with outrageous pressure. I destroyed a few molds before getting the feel for just haw far to push it. I did find for some of our work that it was faster to use a rubber mallet and beat the clay into the mold. @ Kathleen – this might be a good solution for you – bolting it to the floor that is. You could if you built the pressure plates large enough. It would be a long process compared to using a slab roller and cutting with a template. Yeah. But I have 265 tiles to make!!! I meant 12″ x12″ x 1/2″. Thanks! Yes I figured that. But to use a press like this 256 would take 10 times the time. You should look in the texas tiler with air release. Yes. Thanks. Know about them, bug thy only make up to a 10″ tile. I need a finished size of 12×12. I’ll be slab rolling and cutting! Thanks. Your articles about hydraulic pavar press will certainly enlighten us with the knowledge. Are you still monitoring this thread? I am fascinated by your solution! I am thinking of buying that jack at HF and replacing the manual hydraulic jack with a air over hydraulic one. They cost about $80 and there’s a youtube of a guy that did it and it seems fine. I want to do like 40-50 tiles and hour and the manual pump would make that impossible to get anywhere close to. I saw a video on You-tube with that conversion. He added an inline oil filter so that’s a piece of the puzzle I haven’t figured out yet but I’m worried it’s not made to be used continuously and will just break quickly. In one comment on the air powered ones it was mentioned to use the air to get close to surface and then use the manual lever to control pressure. Does that sound like a reasonable conversion based on your experience? Could the bottom be raised up real close so the manual one does not need to travel so far? I currently use air release molds but the mallet pressed will not do the fine detail and is a bit tiresome to do a lot of them. I want to somehow mount my air release mold, press and then air release the tiles. Not sure whether to try and mount the die on top plate and press into clay so air released tile just drops out or sit on bottom plate with some type of flip rigged to air release. I hope that makes some sense, I would love to hear your input?. or maybe extend a pipe all the way down so you only have to pump a few time to press? scratch that, I see that you did bring yours all the way down. Looks like your trying to build a ram press. We stopped using ours. 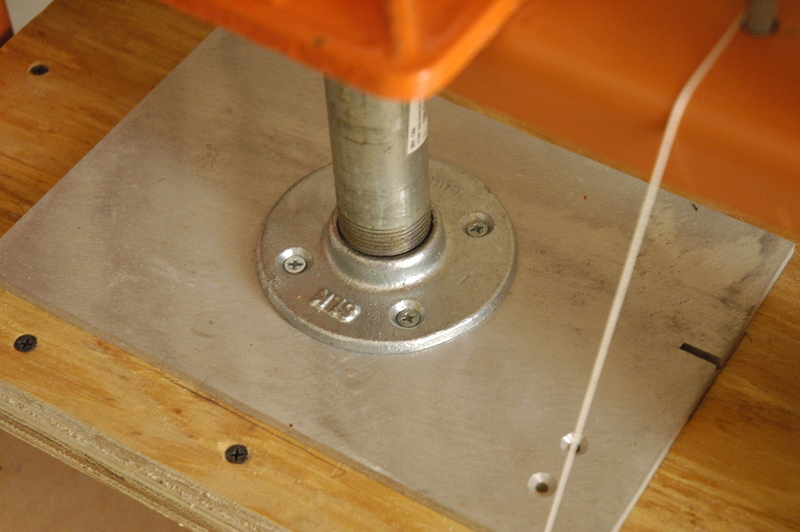 It needs an adjustable pressure stop bolt so the jack can only press so far before breaking the mold. Just hand packing the molds and using a rubber mallet worked better for us. We aren’t going for the volume you need to make. Yeah that is essentially the goal. I am not trying to slam the commercial presses out there and we may in the end go that way.The cost of the commercial presses rival the cost of a nice car though and sure seems like a lot to accomplish what is at the end of the day is rapidly pressing clay into a mold with enough force to get the needed detail. Air release molds provide rapid de-molding and air over hydraulics add some speed to the pressing process.Using the pressure stop bolt along with switching to manual for the last couple of pumps coupled with strong plaster like ceramical on the surface seems to pull together a group of inexpensive technologies and possibly have the functional equivalent of a small press that cost many thousands to buy and at a cost of probably a few hundred bucks..
You have experience using both, do you think I am wasting my time trying to do this.